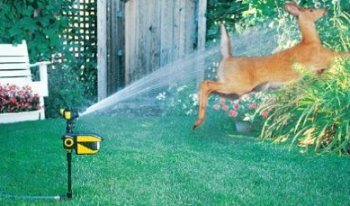 For around 60 bucks you can get a device that combines motion detector technology and sprinklers in a way that might work for some folks with a deer problem in their yard or garden. The CR0101 motion activated sprinkler seems like it would keep a wide array of varmints from your precious plants, but like with any new product the knowing is in the testing and proving that it works under real world conditions. This might also be the perfect and humane way of keeping small children from entering your yard to retrieve their ball or Frisbee. We finally solved the deer in the garden problem, and the solution was so elegant we gave it a new website. Check out our deer deterrent website for free plans!